The full text of Herodotus is online at Project Gutenberg. For convenience, I have pasted the bit we need here. Herodotus claims to have been to Babylon himself, but in his description of the city (Histories, Book I, sections 178-184), he never mentions the gardens. This is usually taken as proof that they did not exist when he was there since it is assumed that no one could seriously have overlooked them. In that case, our other two eye-witnesses, writing fifty and a hundred years later, couldn't have seen them either and the whole shebang collapses into idle fancy. Alternatively, he might have missed the gardens because he never really went to Babylon, in which case he is a liar—and his description can indeed seem like the exaggerations of a liar, so we need to think about it carefully. Herodotus' description of Babylon is so extraordinary that Jona Lendering characterises it as "nonsensical". Lendering objects primarily to the extreme dimensions and the hundred bronze doors in the city wall, complete with bronze frames and lintels. And others have also quarrelled with Herodotus' description. The 18th-century Historian, Edward Gibbon (famous for The Decline and Fall of the Roman Empire) was so incredulous that he accused Herodotus of never having set foot in Babylon at all. My own view is that most of this is bogus. Here's why. 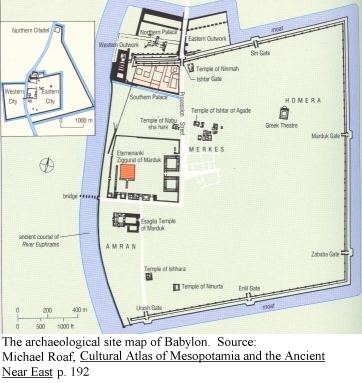 Firstly, it is worth noting that without the measurements, Herodotus' description of Babylon matches the archaeological record very well, and his description of Babylonian building techniques also accords with the other eye-witnesses. Secondly, the measurements attributed to Herodotus may be misleading. Herodotus states that the city is square and outer walls (see inset in the above plan) measured 480 furlongs altogether—that is, an incredible 60 miles total length! However, if that measurement represented the area instead of the perimeter, it would produce a square city with walls just under 2¾ miles long, and that shape and size matches the archaeological record very well. His other measurement, for the ziggurat enclosure (his Temple of Zeus Belos), is 2 furlongs (¼ mile) per side, as against the archaeological measurement of 1½ furlongs. No big deal. So it is possible that the biggest objection to Herodotus' text amounts to a transcription error sometime during the last 2400 years. The third objection is to the 100 bronze doors in the outer city wall, one at the end of each street. That would be 25 per side set about 400 ft apart—that is, getting on for the length of a modern American city block. This is not an unreasonable distance, but to my militarily inexperienced mind it would make the city difficult to defend. That certainly seems to be a problem—but is it enough to toss Herodotus out? Finally, his failure to mention the gardens is our problem, not his. This useful summary of Herodotus makes it clear that his focus of interest was the Achaemenid dynasty. This dynasty never claimed to have built the gardens, so there would be little reason to discuss them. On the other hand, he does have a reason to mention the ziggurat enclosure (his Temple of Zeus Belos) because he lists Zeus Belos among the ancestors of the Lydians (Book I, section 6)—and he describes Babylon while telling about the conquest of Lydia. So, finally, note also that Herodotus' description of the city is very selective—the walls in some detail, the temple of Zeus Belos in some detail, and a mere reference to the palace. The other eye-witnesses, Ctesias and Clitarchus, both state that the garden walls were no more than 400 ft long: the length of a single block in a city of about 625 blocks square. Assuming the gardens existed, is it really so extraordinary that he would not have bothered with them? Herodotus is either so unreliable as to be effectively useless, or his silence about the gardens tells us nothing. Either way, he no longer contradicts the later descriptions.